Kang Dong-Goo dreams of becoming a movie director, but he is cynical due to bad luck. Cheon Joon-Ki wanted to follow in his father's footsteps and become an actor, but he is now just a minor actor. Bong-Doo-Sik came to Seoul to become a scenario writer, but things have not been easy for him. Where can you stream Welcome to Waikiki? On 2018-02-05 Drama/Comedy TV Series Welcome to Waikiki first aired on JTBC. 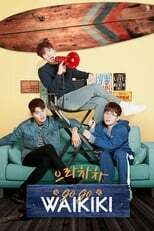 Written and created by , and produced by Dramahouse, Welcome to Waikiki will return and was last broadcasted on 2019-04-22.